The composition and visual effects of Night Sea reflect the remarkable balance of rationality and intuition that informs Edna Andrade's approach to painting. Created from simple straight lines of iridescent green and pink on a rich blue-black ground, the rhythmic, wavelike image is at once solidly geometric and precise as well as constantly in flux. Seemingly without beginning or end, the painting changes, depending on where the eye and mind focus. Straight lines curve, colors emit different intensities of light, and inescapably flat elements bend, project, and bulge into space. Every line of Night Sea seems to connect to every other line and then to change color and direction at sharp angles, either splayed out to produce a generous curve or concentrated into dense knots of color, light, and energy. An influential artist and teacher who has lived and worked in Philadelphia since 1946, Andrade first explored optical phenomena in her painting in the 1960s, when she was presenting courses on color and design at the Philadelphia College of Art. The clarity of her conception and the sureness of her drawing also reflect her work in the 1940s as an architectural draftsman for government projects. 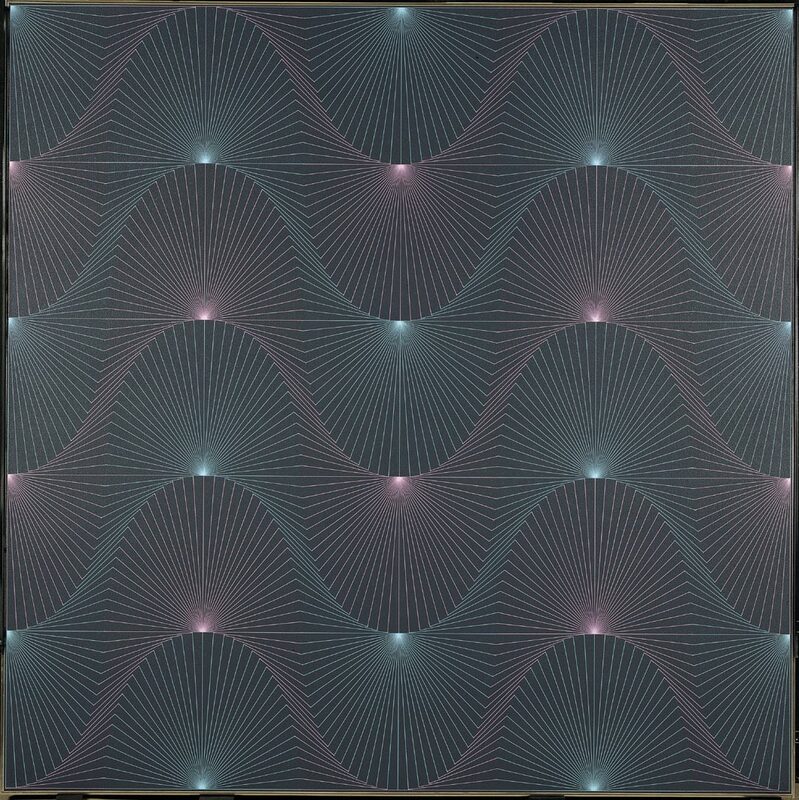 Night Sea belongs to a group of works from the 1970s painted with a limited palette of bright colors finely drawn on dark grounds in which she devised mathematical systems to generate elegant, curving surface patterns and surprising visual effects using straight lines. The rules she used are only intermittently revealed by close observation; more prominent are the organic unity of the whole, the delicacy of the line, and the interdependent relationship of drawing, volume, color, and light that Night Sea projects. Its colors and fluctuating waves recall the effects of phosphorescence in the ocean glowing on a dark night, joining principles of science and wave theory with her inspired imagination to determine the ordered principles that structure her painting. Twentieth Century Painting and Sculpture in the Philadelphia Museum of Art (2000), p. 124.